Roborock S5 robot vacuum review: Affordable and intelligent? If you've never heard about Roborock then, well, now's the time to listen. The S5 is an affordable, capable and intelligent robot vacuum cleaner that does as good a job as bots that cost twice the price. The Roborock S5 robot vacuum cleaner is the second robot cleaner from Roborock, a brand name that you've probably never heard. It's certainly not one to be overlooked though. A telltale sign is an investment in the company by Xiaomi, the Chinese major. But the S5 doesn't need the endorsement of a big brand in order to succeed, its quality speaks for itself. We've been living with this robotic vac for a few months now to see if it's better than its pricier, better-known competitors. 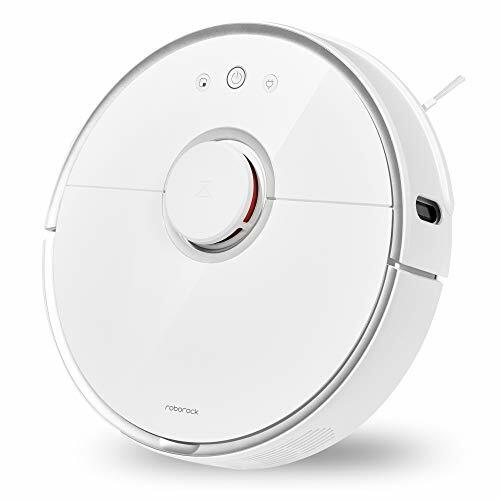 At first glance, other than the shiny pearl-like finish, you'd be forgiven for thinking the Roborock S5 robot vacuum cleaner was just like any other. All the usual design features are present: the charging dock, main cleaning brush, side brush, multiple sensors and bump rail. But there's a lot more to this cleaner than first meets the eye. For starters, the S5 is also a mopping bot. It's also smartphone app-controlled, boasts an intelligent mapping system, has multiple settings and features, plus much more besides. The smallest design details have been considered too. For example, there's a brush stored under the top cover with a sharp blade built right into it, which canbe used to easily cut hair and fibre from the main brush to keep it cleaning effectively without messing around with scissors or sharp points. The supplied filters are washable and everything is easy to access, meaning it's simple to keep this robot in tip-top shape and cleaning efficiently. On the S5's exterior are three buttons which allow you to easily set the robot off, pause, dock for a charge, or start spot cleaning. A bold orange sensor sits neatly housed on top, too, which helps the bot get around and find its way back to the dock when it's finished. Setup of the Roborock S5 requires the Mi Home app for either Android or iPhone devices. In the app, there's easy access to numerous settings for getting the robot to clean just the way you like it. Multiple cleaning modes are available, including: Quiet, Balanced, Turbo, Max. Automatic scheduled cleans can be set on a daily basis, while multiple schedules are also an option. This means you can not only set the robot to come out every day, but also multiple times a day or at different times on different days. You can change the cleaning/suction power on the fly, even setting different suction levels within the timed schedules – so you could send the S5 out in the morning or at night on a quiet cleaning cycle, but max clean during the day – and there's even a carpet mode which increases suction accordingly on such surfaces. You can also control the robot and tell it to go to a particular spot. You can also set a spot cleaning mode, which is different from other robots we've seen: whereas most spot cleans involve a spiral clean outwards from the centre, the S5 cleans in an up and down pattern. The most interesting feature, though, is the S5's intelligent mapping system. We've seen a similar system in the Ecovacs Deebot R95 MKII, but were even more impressed this time around. Each time the Roborock S5 begins a clean, it uses a combination of its 13 sensors and so-called 'SLAM algorithms' (no, we don't know what that means either) to intelligently map rooms. Travelling around the edges of each, the bot scans to get an idea of the layout before moving inward. This real-time mapping works incredibly well. Especially if the contents of rooms has changed: if a chair has moved or kids toys are piled up in the way then the S5 will know, avoid getting stuck, and also clean more effectively. The mapping system also includes the ability to save maps and add no-go lines and no-go zones to any area of your home. You can draw up to 10 of these no-go sections on the virtual map to prevent the robot cleaner from going places it shouldn't. The Roborock S5 has a multitude of sensors that include four cliff sensors underneath, wall sensors to the sides, and the usual bump rail to avoid damage. The laser-detection scan technology mean it's not only capable of accurately mapping out the areas that need cleaning, but it's also less likely to get stuck. There was only one time when the S5 got stuck under a child's bed. We picked the bot up, moved it to another room and it resumed cleaning. When it finished, it still managed to get back to the charging dock without any fuss - which is not something many other bots can handle. The large main brush and single front brush get the job done well, whether on carpet or hard flooring. This robot cleaner manages edges well and cleans from room-to-room with ease too. We didn't find the day-to-day noise levels to be overpowering either. We did find that scheduled cleaning is a bit different to other bots we've tested though. On a timed clean, the Roborock S5 makes a single pass of all the flooring areas it can reach. In our home, that equated to around 20 minutes of cleaning before it returned to dock. Most other robot vacuum cleaners will keep cleaning until they run out of juice, this one finishes when it thinks it's done. If you prefer your robot cleaner to keep cleaning for longer, you can set more timed cleans throughout the day or set zoned cleanups instead. For manual cleaning, there's a remote control built right into the app which allows for joystick-based controls, or you can set a specific point on the map and tell the robot to go there and start cleaning. The 480ml dustbin is smaller than others we've seen, but it's also easy to remove, clean and replace. It's also where the filter is housed, which can be washed and replaced (a spare is provided). In addition to standard vacuuming, the Roborock S5 is also capable of mopping. A slimline mopping system with two high-quality microfibre cloths is included in the package. It's easy-to-use too: simply fill the water reservoir, attach a damp microfibre cloth, block off entrances to carpeted rooms, then set the robot off in mopping mode. We did find that this system's water reservoir is thinner and therefore holds less than other mopping systems we've tested. That doesn't mean it isn't capable though. It does so in style too. It's easy on the eye, feature rich and we like how the real-time intelligent mapping system works. Having no problems with docking and no need to interfere with the robot while it cleans feels like the ultimate dream. At a smidge over £400, the Roborock S5 is a cleaning force to be reckoned with. It's far more affordable than many other robot vacuum cleaners and often more capable too. Originally published 19 October 2018. Like the Roborock, the Ecovacs Deebot R95 MKII is a feature rich bot with an intelligent interactive mapping system. It's also powerful and does a fantastic clean, but is slightly more expensive than the S5. The Dyson 360 Eye is one of the best robotic vacuum cleaners we've tested. It's a bit tall for our liking, so struggles getting under some furniture, but is bursting with features and is a really capable cleaning machine. As with all things Dyson, it comes with a hefty price tag, but you do get what you pay for.